Start spreading the news – she’s leaving today. 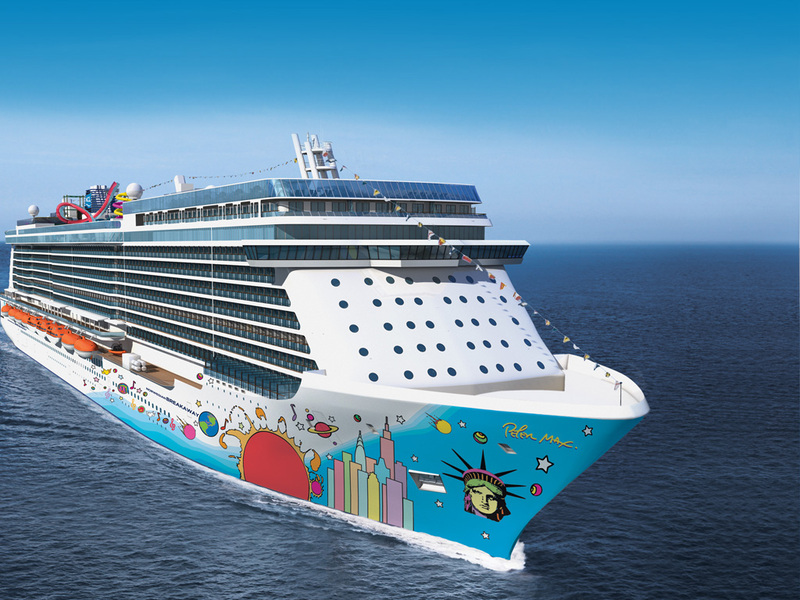 Norwegian Cruise Line’s new ship Breakaway is heading for her home port of New York after wowing British fans in Southampton. From the colourful Manhattan skyline on the hull to a frozen Statue of Liberty in the ice bar, this baby is New York-themed and, like the Big Apple itself, a city that never sleeps. Around the clock, this 4,000-passenger vessel is packed to the funnel with activities, restaurants, bars and entertainment. In the morning, you can explore the Aqua Park with its five waterslides, including a 40mph freefall chute, or tackle the ropes course, featuring a zip wire and the formidable Plank, jutting 8ft over the sea. In the afternoon, wander along The Waterfront, where restaurants spill out on to the promenade. Relax on the sun deck, play a game of miniature golf or basketball, or be pampered in the spa. Then at night there’s the choice of three Broadway shows – musical Rock Of Ages, dance hit Burn The Floor or Cirque Dreams Jungle Fantasy. Afterwards, chill in the ice bar, laugh in the comedy club, enjoy the laid-back notes of the jazz bar, or dance into the early hours in the Bliss nightclub. The choice of 28 dining options is both eye- and mouth-watering, from steak to sushi, pasta to teppanyaki. Or treat yourself to a special evening in celebrity chef Geoffrey Zakarian’s fish restaurant Ocean Blue. With Breakaway, Norwegian has matured from its youth of eye-poppingly lurid carpets and its awkward middle years of the boxy ‘loft extension’ on Epic. It has aimed to take the best of all its previous ships and add a touch of sophistication and style, like the private Haven area with its own pool, courtyard and restaurant. For small-ship lovers, Breakaway would be their idea of hell. But for families, young couples and singles, it offers a constant supply of new tastes, surroundings and experiences to keep you coming back for more. Melt away your little town blues, unleash the inner New Yorker in yourself and enjoy it. This entry was posted in New ships and tagged new ships, New York, Norwegian, Norwegian Breakaway, Southampton. Bookmark the permalink. Yeah not sure if this would be for me but I suppose shouldn’t knock it unless you tried it! Thanks for your comment, Danny. As I said, it would be some people’s idea of hell but thousands will love it! Next week I am on Hapag-Lloyd Europa 2, at the other end of the cruise spectrum. I hope you’ll follow my trip on that, too. Best wishes. Wow what a difference! Look forward to reading. Wouldn’t mind having a review from you on our blog regarding the Europa 2 ? Thanks for the offer, Danny. I only post to my own blog but happy for you to quote, with shipmonk.co.uk credit and link to the full story. Best wishes.